Notice the car is still camouflaged and notice the “8” is in red signifying, of course, the next car will be the eighth-generation Corvette or C8. Just like many people refuse to acknowledge the structure of the US republic many people refused to believe the C8 would be mid-engined. For example, someone with the Corvette Museum told me in January that not all C8s would be mid-engined. When I tried to explain otherwise, he wouldn’t listen. No, I am not sorry I recently purchased a used C7 Z06. I am, however, very excited to see the new C8. According to some sources the C8 “Z06” may have 650-700 HP, the “ZR1” may have 800-850 HP and as noted in the article the “Zora” may exceed 1,000 HP. The amazing thing is that the base C8 Corvette will not be as expensive as many had feared with prices starting only about $5,000 more than a base C7. I am very, very idiosyncratic. I like many things most people don’t like and/or have never heard of. This trait applies to cars. While I like C2 Corvettes and second-generation Chargers I also like cars like the Buick Reatta and Cadillac Allante. I guess in one way that affinity is not so weird in that I am drawn to the looks of both cars. Who doesn’t like a pretty face? From this Hemmings listing a picture of a 1990 Buick Reatta. Many of those who have any positive feelings about the car at all prefer the convertible, but I prefer the coupe, of course. By 1990 Buick had gone back to a conventional analog dashboard and controls as opposed to the troublesome digital ones. This car has 91,000 miles and the dealer is asking $4,900. I think it’s a beautiful car and yes I know it’s not a sports car or high-performer. From this Hemmings listing a picture of a 1993 Cadillac Allante in Verde Flax (Green) over Black. Only for 1993 the Allante was powered by a Northstar V-8 (which initially had problems with head bolts and overheating) of 4.6 liters/279 cubic inches displacement that produced 295 HP/290 LB-FT of torque. The dealer is asking $9,595. C’mon, people! The Allante body was designed and built by Pininfarina! It’s a beautiful car, but was fraught with quality issues during almost the entire run and was underpowered at first. The engine for 1987-88 had only 170 HP/235 LB-FT. I guess people don’t read blogs on Thanksgiving. I also have never really paid that much attention to daily views before. Despite a dramatic decline in views/visitors since about the 10th of November, this month has seen a new high for both metrics. Thanks, but I wish all of the readers who were visiting in late October/early November would come back. People don’t really judge events by objective reality, but against expectations and compared to the status quo. Before the increase in views/visitors in late October I wouldn’t have been affected by the number since November 10, but now those metrics are a disappointment. If the Arizona Cardinals and Pittsburgh Steelers both finish with 8-8 records in 2019, for one team it would represent a great year while for the other a great disappointment even though it’s the same record. Somewhere in this post will be the 100,000th word I have written on Disaffected Musings. I have had three books published and if my memory serves me correctly the last two were each about 100,000 words in length. Not to make too fine a point, but in the 10 1/2 months I have been posting to this blog I have written enough for a book. Probably not coincidentally, that’s about how long it took (perhaps a little longer) to write each of my last two books. Another picture from the Classic Auto Mall in Morgantown, PA. (No, I do not work there. It would be an awfully long commute.) This is a Buick Reatta and I confess I don’t know the year. I have always been enamored of the looks of this car, but like the Cadillac Allante of the same period the Reatta was a GM two-seat car that was a failure. The Reatta was never marketed as a sports car or high-performance car, a fact that would exclude it from my Ultimate Garage. However, I think it would make a great “wolf in sheep’s clothing” restomod although the FWD layout might be an insurmountable obstacle. Any thoughts from any of you on the Reatta, the Allante or any other topic? Why were both cars such failures? My marvelous mom was born on this day in 1922. She has been gone a long time, but I think about her every day. She had a rough life as a Holocaust survivor and displaced person (recall from this post that my parents married in a Displaced Persons camp and that my older sister was born there), but she carried on as a loving mother and grandmother. I am thinking of dancing with the devil. I have been considering establishing a Facebook account in order to promote this blog. I have severe misgivings, but Facebook is the platform and if I want more people to read, to comment, etc. then I am beginning to think I have to use them, as much as I despise them. What do you think? 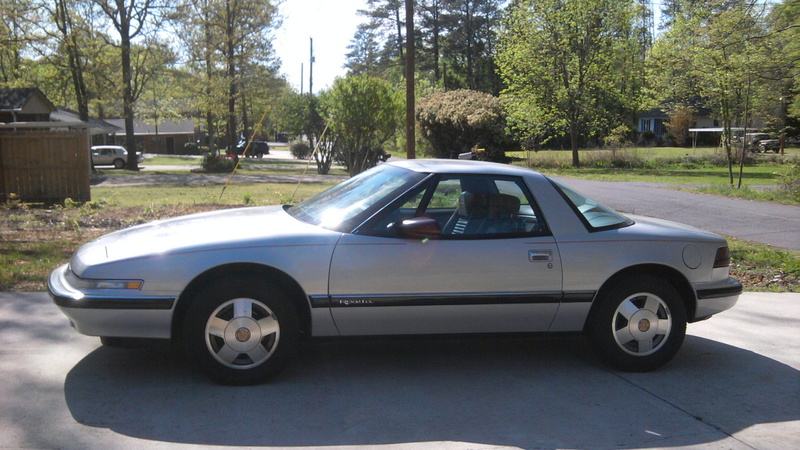 From cargurus.com a picture of a Buick Reatta, another General Motors failure of the 1980s/1990s. I know the Reatta is not a performance car, but I love the way it looks. I figure I could improve the performance somehow if I were to acquire one. Innovative Performance Chips is a company that sells engine tuning chips and even, supposedly, offers such a product for the 3.8 liter V-6 Reatta engine. They claim up to 35 additional HP (no mention of increased torque) AND up to five more MPG with their product. I am skeptical, but +15-20 HP and +2-3 MPG would be fine. When I moved to California in the mid-1990s, I purchased a car from a Buick/GMC/Pontiac dealer. I really wanted to buy a Reatta, but they were no longer being manufactured and the salesman did not want to find me a used one. Fewer than 22,000 Reattas were produced during the four model years it was offered, 1988-1991. I hope to read comments from you on these or any other topics discussed in this blog.